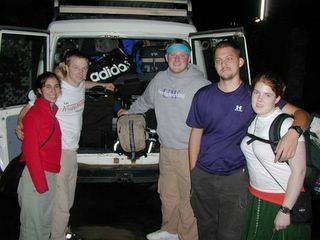 World Deputation 2010: Team Ethiopia has arrived! The UPC Deputation Team arrived a couple of hours ago, tired but in good condition. None of them nor their luggage got lost in transit. Things have been peaceful in Addis Ababa and Ethiopia since last Wednesday and we are involved in our normal activities. Tomorrow, the team will have an orientation at SIM Headquarters. Thursday, we will look at some of the HIV/AIDS ministries and try to visit the Missionaries of Charity AIDS Orphanage (Mother Teresa). Friday, they are scheduled to fly to --------. Ethiopia, it's good to see you all made it safely, and see a post traveling picture of all of you. I am so excited for you guys and everyone who is already at their country! Get some rest. This blog thing is cool. I am so glad you guys had a safe trip there and are starting to get settled in. I'm praying for you and just think, in less than two weeks we'll be on the same continent! Yay! wow, you guys are rad, look like troopers in your first picture. You are all in my prayers, and , umm, did i mention you are all rad?